Book one in my Rochester Public Library 100 Year Reading Project proved to be an entertaining if somewhat silly selection. 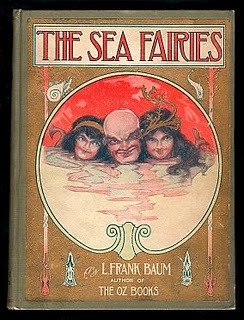 This is the type of fairy story Baum was noted for – a spunky little heroine, a wise old man, mischievous fairy creatures, and a scary monster. Sound familiar? Baum did, after all, write the Oz books. The story begins with the Captain, a retired seafaring man with a wooden leg, telling little Mayre all about the mermaids who live in the deep sea and how “no one whut sees ’em ever gets out alive.” Mayre and the Captain set out one fine day for a simple row boat ride to explore the coast and caves of their seaside home, and when the Cap’n rows them into a favorite spot, the Giant’s Cave, they meet a Mermaid Princess, who uses her fairy magic to give both the child and old man fish tails and the ability to breathe underwater. They are taken to visit the Mermaid Queen, who introduces them to all sorts of sea creatures, including King Anko, one of the four ruling sea serpents in the oceans and the oldest one alive. During one of their forays into the ocean depths, the Mermaid Queen, Princess, Cap’n and Mayre (for some reason called Trot), are captured by a wicked magician who was defeated once by King Anko and took refuge in an invisible traveling castle. The wicked magician toys with them, until the Mermaid Queen finally decides it’s time to break out, which they do, with a little help from King Anko, who finally destroys the wicked magician for good. How do mermaids breathe underwater without gills? There is a very thin layer of air surrounding the mermaids’ bodies which keeps them warm and essentially dry and allows them to breathe naturally. Ever see bubbles coming up from the ocean floor? That’s mermaids breathing, of course! A number of the scenes reminded me very much of Sponge Bob Squarepants, in fact. Decades before our friendly yellow sponge debuted on TV, Baum imagined full service restaurants at the bottom of the sea and creatures living in domed castles and homes. I bet when they were kids, someone read The Sea Fairies to the creators of Sponge Bob and some of the fantastic descriptions stuck. I’d bet Baum would be a fan! For students of children’s literature, this would be a lighthearted, quick read. Fans of the Baum’s Oz books will appreciate the imaginative plot and plucky characters.